In a mixing bowl add flour, ajwain and salt. Add melted butter or ghee in to the flour mixture. Incorporate the fat in the flour as shown in the video. Gradually add cold water in batches. Don't make the dough too wet, when they are rolled together that's it ie make a stiff dough, then only it holds the shape. Keep covered and rest it for 30 minutes in refrigerator (meanwhile you can prepare the filling) . Boil the potato to make in to cubes (don't overcook it turn mushy at the same time don't under cook, I pressure cook with enough water for a single whistle). Also once cooked let them cool completely, later peel off the skin and slice. In a pan / kadai add little oil. Temper with whole dhaniya / coriander seeds. Add chopped onion and ginger garlic green chili paste. Once they sautéed well add all the masala powders mentioned in the filling ingredient list. Add the green peas and corn, saute till they turn tender (they don't take much time to cook). Finally add the cubed potatoes and saute for 3- 5 minutes in medium flame so the masalas coats well with potato. When they cool completely, add shredded cheese (reserve some to top on the samosa cups later) and mix well. Roll the dough using rolling pin and using circle cookie cutter or any cup (refer video) cut and stack the dough and make sure it fits in the muffin cup. Don't forget to stretch the dough a bit. 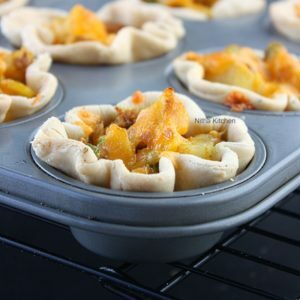 In a butter or oil greased muffin pan, arrange the samosa dough. You can apply some butter on the edges of the unbaked samosa cups. Add the filling and top it with reserved cheese. In preheated oven bake at 375 F for 15 minutes or till they turn light brown. Depends on the Maida / APF flour you may get color variation in your samosa cups, I use unbleached flour always.